All the iPhones. All of 'em. Now that iOS 7 has been announced, attention has turned to what hardware Apple will launch alongside it, be it an iPhone 5S or an iPhone 6. Today several insiders have told Reuters that Apple has been mulling over the possibility of a 4.7-inch iPhone as well as a 5.7-inch device straying in the direction of the 'phablet' arena. What's more, these chatty source-types have conceded that Apple has 'floated' the idea of a cheap iPhone model with a price tag of $99 (that's around £63 or AU$103), with the budget range coming in up to six colours - a rumour we've heard before. But before you chuck your Samsung Galaxy Ace out the window and run down to form an orderly queue outside your local Apple Store, take a knee. The plans are still being explored, the four people "with knowledge of the matter" say, with plans laid out for cheap iPhone launches over the next four years. 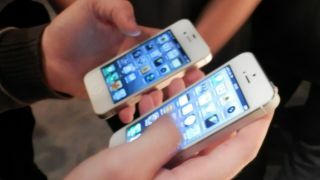 The bigger-screened iPhones, however, are supposedly set to launch next year which means that one could feasibly be known as the iPhone 6. Although one tipster told the news agency that Apple "constantly change product specifications almost to the final moment" so there's no way to be sure of what the company really and truly has in the pipeline, it's not outside of the realms of possibility that Apple wants to stomp all over the Samsung Galaxy Note 2's turf. So, that's bigger iPhones, smaller iPhones, more expensive iPhones, cheaper iPhones and multi-coloured iPhones all coming within the next four years. At least one of these rumours has gotta be right. But which? We love a good speculation sesh, but sometimes outlandish iPhone rumours really get our goat.